Klayman: Zion Seems Like a Nice Kid but He Should Pay Duke Back for His Scholarship Since He Never Had an Intention to Graduate! Same Goes for His Teammates Barrett and Reddish! 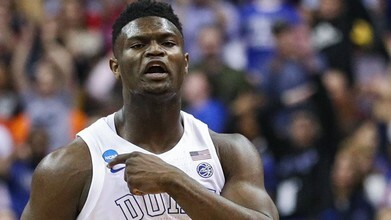 LOS ANGELES -- Zion Williamson of Duke added to his 2019 awards haul Friday night, becoming just the third freshman to win the John R. Wooden Award as the nation's men's player of the year. Williamson, 18, joined Kevin Durant and Anthony Davis as the only freshmen to take home the award, which was handed out at the fifth annual College Basketball Awards at The Novo in downtown Los Angeles. He is the sixth Wooden Award winner in Duke history, the most of any school.